Remember wood paneled station wagons? Well, wood is back, but this time it’s not for aesthetics — it’s for reducing vehicle weight with renewable materials. 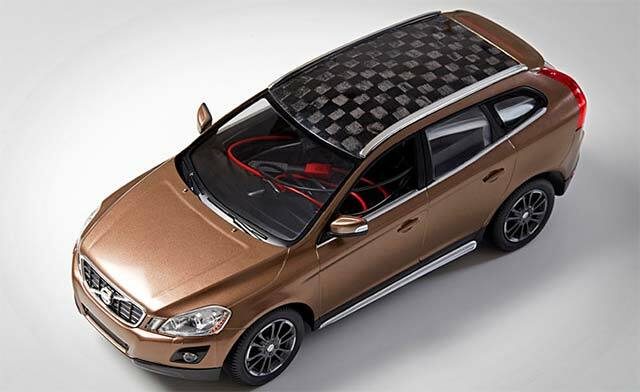 Swedish researchers have produced what they call the world’s first model car with a roof and battery made from wood-based carbon fibre. Although it’s built on the scale of a toy, the prototype vehicle represents a giant step towards realizing a vision of new lightweight materials from the forest, one of the benefits of a so-called bioeconomy. The demo is a joint project of KTH Royal Institute of Technology, the Swedish researcher institute Innventia and Swerea, a research group for industrial renewal and sustainable development. The key ingredient in the carbon fibre composite is lignin, a constituent of the cell walls of nearly all plants that grow on dry land. Lignin is the second most abundant natural polymer in the world, surpassed only by cellulose. Göran Lindbergh, Professor of Chemical Engineering at KTH, says that the use of wood lignin as an electrode material came from previous research he did with Innventia. Lignin batteries can be produced from renewable raw materials, in this case the byproduct from paper pulp production. He says that eventually, carbon fibre bodywork and batteries could be combined to simultaneously manage mechanical loads and store electrical energy. The research was carried out in the strategic innovation program, Bioinnovation, a joint effort by Vinnova, Formas and the Swedish Energy Agency.